E. D. Hirsch, Jr. is the founder and chairman of the Core Knowledge Foundation and professor emeritus of education and humanities at the University of Virginia. He is the author of several acclaimed books on education issues including the best-seller Cultural Literacy. 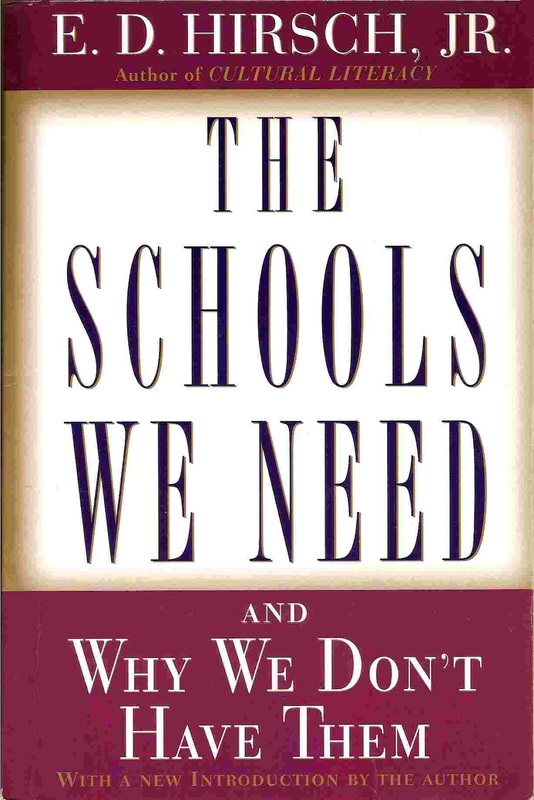 With his subsequent books The Schools We Need and Why We Don’t Have Them, The Knowledge Deficit, and The Making of Americans, Dr. Hirsch solidified his reputation as one of the most influential education reformers of our time. Read Sol Stern's "E. D. Hirsch's Curriculum for Democracy: A content-rich pedagogy makes better citizens and smarter kids", City Journal, Autumn 2009, Vol. 19, No. 4. By Core Knowledge Founder E. D. Hirsch, Jr.
"Another Kind of Dyslexia: Incomprehension" Keynote address, New York Branch of the International Dyslexia Association, 35th Annual Conference, March 7, 2008. Audio recording. "Plugging the Hole in State Standards, One Man's Modest Proposal" American Educator, Spring 2008. "The Knowledge Connection" Washington Post and other newspapers, February 15, 2008. "Narrowing the Two Achievement Gaps" A presentation at the 18th Education Trust National Conference, Washington, D.C., November 9, 2007. "Strategic Thoughts — Undelivered Remarks", Philanthropy Roundtable, November 10, 2006. Manhattan Institute Talk about The Knowledge Deficit and New York City reading scores, May 4, 2006. “The Case for Bringing Content into the Language Arts Block and for a Knowledge-Rich Curriculum Core for all Children” American Educator, Spring 2006. “Many Americans can read but can’t comprehend” USA Today, February 25, 2004. “Neglecting the early grades” in Our schools and our future: are we still at risk? ed Paul E. Peterson. Stanford, Calif. : Hoover Institution Press, 2003. “Not So Grand a Strategy,” Education Next, Spring 2003. “Reading Comprehension Requires Knowledge — of Words and of the World” American Educator, Spring, 2003. “Classroom Research and Cargo Cults” Policy Review October/November 2002. “Breadth Versus Depth: A Premature Polarity” from Common Knowledge, Fall 2001. “The Latest Dismal NAEP Scores: Can We Narrow the 4th-Grade Reading Gap?” an essay that first appeared in Education Week, May 2, 2001. “Ideas, Convictions, Courage: People Tell the Story of Core Knowledge" Common Knowledge, Spring 2001. “Jeanne Chall's Last Book,” American Educator, Spring 2001. “Overcoming the Language Gap,” American Educator, Summer 2001. “The Roots of the Education Wars” Catholic Education Resource Center, 2003. Reprint from presentation at a 2001 conference. Also adapted and published in The Great Curriculum Debate: How Should We Teach Reading and Math? edited by Tom Loveless. The entire text of this book may be read at Google Books. “The SAT: Blaming the Messenger” The Hoover Institution Weekly Essay, May 28, 2001. “The Tests We Need and Why We Don't Quite Have Them” an essay that first appeared in Education Week, February 2, 2000. “You Can Always Look It Up — Or Can You?” adapted from the closing address at the 9th Core Knowledge National Conference, Anaheim, California, March 18, 2000. “Romancing the Child” an article adapted by Education Next from a speech given at Harvard University in October 1999. “Why Core Knowledge Promotes Social Justice” convocation address, University of Tennessee, Chattanooga, October 6, 1999. “An Address to the Joint Committee on Head Start Reauthorization” March 26, 1998. “Class Size: A Question of Trade-Offs” excerpts from testimony before the Joint Congressional Subcommittee on Early Childhood, Youth and Families Hearing, February 24, 1998. “Heroes of Education Reform” Common Knowledge, Fall 1998. “Why General Knowledge Should Be a Goal of Education in a Democracy” address at the 7th Core Knowledge National Conference, Atlanta, Georgia, March 14, 1998. “An Address to the California State Board of Education” April 10, 1997. “Toward a Centrist Curriculum: Two Kinds of Multiculturalism in Elementary School” an essay for the Core Knowledge Foundation, 1991. “What Al Shanker Taught Us,” The Washington Post, March 1, 1997, Op-ed. “Why Traditional Education is More Progressive” The American Enterprise, March/April, 1997. “Challenging Intellectual Monopoly” an excerpt from The Schools We Need & Why We Don't Have Them, 1996. “Reality’s Revenge,” American Educator, Fall, 1996. An excerpt from The Schools We Need. “Fairness and Core Knowledge,” an essay for the Core Knowledge Foundation, 1992. "teach the child, not the subject." This is an excerpt from Hirsch's great book on education : The Schools We Need and Why We Don't Have Them. This critical guide to terms, phrases, and slogans widely used by the American educational community is conceived as a kind of typhoid­-tetanus shot, a controlled dose of the pathogen in nontoxic form to inoculate those who become exposed. Prospective teachers and members of the general public are bemused, bullied, and sometimes infected by seductive rhetorical flourishes like "child-centered schooling" or bullying ones like the dismissive words "drill and kill." 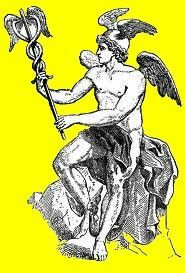 These terms and phrases pretend to more soundness, humaneness, substance, and scientific authority than they in fact possess. Promulgating this system of rhetoric has been an ongoing function of Ameri­can schools of education, whose uniformity of language and doctrine ensures that every captive of the teacher-certification process and every professor trained to continue the tradition is imbued with educationally correct phrases. Consensus-through-rhetoric has been one of the main instruments of the Thoughtworld's intellectual dominance. As an example of this uniformity in teacher preparation, I quoted on pages 129-30 a typical passage from an education-school textbook called Best Prac­tice. The authors claimed that a doctrinal consensus exists among the important educational organizations — including the National Council of Teachers of Mathematics, the Center for the Study of Reading, the National Writing Proj­ect, the National Council for the Social Studies, the American Association for the Advancement of Science, the National Council of Teachers of English, the National Association for the Education of Young Children, and the Interna­tional Reading Association — regarding the best principles of pedagogy. These consensus principles were lauded as "child-centered," "progressive," "devel­opmentally appropriate," and "research-based." On the authority of this professional consensus, teachers were instructed to de-emphasize and deplore practices represented by bad words like "whole­class instruction," "passive listening," "textbooks," "broad coverage," "rote memorization of facts," "competition," "grades," and "standardized tests," and to accentuate practices represented by good words like "hands-on learn­ing," "discovery learning," "less is more," "student responsibility," "individ­ual learning styles," "cooperative learning," and "nonstandardized assess­ments." None of this advice is sound. Yet, for any prospective teacher to whom the advice is presented so authoritatively and repeated so often, it would be reasonable to assume that it must be true. Repetition and consensus give the phrases a self-evident, not-to-be-questioned quality which induces those who repeat them to believe them earnestly and implicitly. · Tool conception of education: "accessing skills," "critical-thinking skills," "higher-order skills," "learning to learn," "lifelong learning," "metacognitive skills," "problem-solving skills," "promise of technology. · Romantic developmentalism: "of their own Pace," "child-centered school­ing," "developmentally appropriate," "factory-model schools," "individual differences," "individualized instruction," "individual learning styles," "multiaged classroom," "multiple intelligences," "one size fits all," "stu­dent-centered education," "teach the child, not the subject." · Naturalistic pedagogy: "constructivism," "cooperative learning," "discov­ery learning," "drill and kill" "hands-on learning," "holistic learning," "learning by doing," "open classroom," "multiaged classroom," "project method," "rote learning," "thematic learning," "whole-class instruction," "whole-language instruction." · Antipathy to subject-matter content: "banking theory of schooling," `facts, inferior to understanding," "facts are soon outdated," "intellectual capital," "less is more," "mere facts," "rote learning," "textbook learn­ing," "transmission theory of schooling,". "teaching for understanding." · Antipathy to testing and ranking: "authentic assessment," "competition," "exhibitions," "performance-based assessment," "portfolio assessment." So closely interrelated are the topics mentioned under each of the above headings that the following Glossary will largely omit cross-references in order to avoid bombarding the reader with constantly repeated indications like See also "Accessing skills," "Critical-thinking skills," "Higher-order skills," "Learn­ing to learn," "Lifelong learning," "Metacognitive skills," "Problem-solving skills," "Promise of technology," and so on. The family resemblances among these terms may be owing partly to a process of historical transformation. When a phrase like "learning by doing" becomes discredited, the principle may still live on in a protean transformation like "hands-on learning." If the "open classroom" becomes a source of disillusion, it may be reborn as the "multiaged" classroom. A reader wishing to pursue the transformations of these themes may simply refer back to the groupings listed above, and may also consult the Index to find page references to more extended discussions and documentations in the body of the book. I hope readers will find the Glossary useful. What is valid in the old rheto­ric should be left to flourish, but what is false should be dug up and exposed to common sense. Before we Americans can cultivate new educational ideas, the ancient plot of ground must be weeded. Many people in recent years have expressed a sense that something is not quite right about these facile doctrines in all their various guises. For those persons, the following short commentaries are offered as reinforcements for their own insights and experiences. "Accessing skills." A phrase used to define an aspect of "learning to learn." Accessing skills are currently emphasized by our schools on the grounds that today's knowledge is changing so rapidly that it will be irrelevant tomorrow. It is better to learn how to "access information" (i.e., how to look things up, or how to use a library or computer or spell-check program) than to learn a lot of soon-to-be-outmoded facts. The emphasis on accessing skills is an expression of the tool metaphor of education, which opposes itself to the "banking theory" or "transmission theory" of schooling (which see). The tool conception holds that schooling should emphasize instrumental strategies, such as how to find knowledge, rather than emphasizing knowledge itself. The dominance of this tool idea, which dates back to the early days of the progressive movement, has led our schools to spend a lot of time teaching such techniques as dictionary- or encyclopedia -accessing skills, which must indeed be taught to children but are not inherently difficult skills that take a long time to acquire. They cannot replace students' ready knowledge of varied subject matters and word meanings. A speaker on the radio or television does not pause for listeners to look up the words they don't know. Even when using an encyclopedia or CD-ROM, students without prior background knowledge cannot understand the things they look up. Preparing students to cope with new knowledge is indeed central to good education. But knowing how to look things up, while important, is not by itself a skill that effectively enables students to learn new things. The skill to learn new things consists of both general tactics like accessing skills and a generous amount of "domain-specific" knowledge. Contrary to the tool metaphor, a general ability to learn new competencies never consists solely of accessing strategies but also entails familiarity with the most important knowledge in mathematics, the sciences, the humanities, and the arts. "At their own pace." A phrase implying that children should develop naturally rather than being forced to learn too rapidly; also called "self-paced learning." The idea is a logical consequence of the individualistic approach taken by Romantic developmentalism. Going at one's own pace would seem to be more natural than going at someone else's, but there is no reliable evidence to support the idea of self-pacing. On the contrary, the data show that the imposition of externally set timeliness goals, and rewards greatly enhances achievement, It is true that different children learn at different rates because of variations in their abilities, energy levels, and motivations. Some able students are lazy, and some less able ones diligent; some pick up subjects rapidly, others with painful slowness. Although teachers are indeed able to judge whether a child's slowness is owing to a lack of preparation in the subject, not even trained psychologists can say with authority how far nature or nurture has predominated in determining the pace of slow children. If an inherently able child is slow because of academic and social disadvantages, is it reasonable to say that his or her "natural" pace is slow? Should schools allow such children to fall further behind, or should compensatory efforts be exerted to bring them up to grade level? By the same token, should fast learners be left to their own devices, or should they be challenged with tasks that take them beyond their "natural" level? A good example of the grave problems raised by "natural" pacing is found in teaching the skill of reading. Some children never learn to decode naturally; others gradually work up the skill of reading on their own, simply after being read to. Yet reading specialists have concluded that nearly all children can be brought to grade level in reading, though greater effort must be put forth for children who are slower. Should this greater effort be denied them on the naturalistic principle? The doctrine of "natural" pace has achieved its most alarming expression in the practice of multiaged grouping, an experimental practice for which there is little empirical support, and much evidence for its unfairness. In the early grades, when no one is in a position to pronounce definitively on a child's "natural" pace, the most effective educational systems in the world try to bring all children up to grade level without holding back the fastest students. On the whole, they succeed. "Authentic assessment." A laudatory term for "performance assessment," where students receive grades for their performances on realistic tasks such as writing a letter, producing a play, and solving a "real-world" mathematics problem. Such performances are also called "exhibitions." The progressive tradition has long advocated teaching and testing through "realistic" projects instead of through separate subject matters, and has long rejected tests that probe isolated knowledge and skills. Realistic performance assessments, it is claimed, have a number of advantages over multiple-choice tests, which include being more informative, more motivational, and fairer to minorities and nonverbal students. These claims are often plausible, particularly when performance tests are used as teaching and monitoring devices in the classroom context; for instance, in a course on writing, it is clearly preferable to use writing tasks as tests rather than to use multiple-choice tests. However, performance tests are only one of many monitoring devices in classroom teaching, and they have been shown to be ineradicably subjective and arbitrary in grading. They are not appropriate for large-scale, high-stakes testing because no one has been able, even in theory, to make such tests fair and accurate at reasonable cost in money and time. To serve democratic ends, American educators have pioneered the creation of fair and accurate multiple-choice tests that probe a wide variety of knowledge and skills. The consensus among psychometricians is that these objective tests, rather than performance tests, are the fairest and most accurate achievement tests available. Performance tests, while important as one tool for classroom use, should not play a decisive role in high-stakes testing, where fairness and accuracy are of paramount importance. "Break-the-mold schools." A phrase used by reformers of the 1980s and '90s to encourage school improvement. Some of the proposed break-the-mold changes have given greater governance power to individual schools and to parents. These changes have sometimes been beneficial. Other proposed changes, concerning the goals, contents, and methods of education, have turned out to be already-failed versions of progressive methods, which are now to be enhanced with "technology" (see "Promise of technology"). The rhetoric of breaking the mold implies that novel educational experiments should be tried on children on a large scale. Since there already exist highly effective schools scattered throughout the United States and elsewhere, it is unclear why these successful models should be rejected in favor of novel experiments. "Child-centered schooling." Also formulated as " student-centered schooling," to include the later grades. The phrase is a self-description of progressive education, as in Rugg's The Child-Centered School (1928). The idea is epitomized in the injunction "Teach the child, not the subject" (which see). The opposition between child-centered and subject- centered education implies that teaching which focuses on subject matter tends to ignore the feelings, interests, and individuality of the child. Progressivists describe subject-centered instruction as consisting of lecture format, passive listening, mindless drill, and rote learning, and as directed to purely academic problems that have no intrinsic interest for children. The opposition between subject and child implies that focusing on subject matter is equivalent to inhumane and ineffective schooling. This picture is mere caricature. Observation has shown, on the contrary, that children are more interested by good subject-matter teaching than by an affectively oriented, child-centered classroom. The anti-subject matter position is essentially anti-intellectual. The dichotomy between subject and child has too often resulted in failure to teach children the subjects and the skills they need. Such failure cannot under any principled use of language be described as "child -centered." "Competition." A negative word in the progressive tradition. Progressive educational doctrine advises against graded tests because giving higher and lower grades destroys the spirit of cooperation and of egalitarianism, as well as causing students to work unproductively for grades rather than for the love of learning. It is undoubtedly true that too much emphasis on class rank and too much identification of intrinsic worth with academic grades are both distracting and inhumane. But the spirit of competition has not been eliminated in those progressive classrooms which have tried to abolish it, and what is even more important educationally, effort and learning have declined wherever grades and tests have been abolished. Human nature has proved to be robust. Evolutionary psychologists have argued that all humans retain a residue of competitiveness. Of course, these primal instincts should be moderated and civilized. But the use of grades and of well-devised tests during a course of study has been shown to improve learning. This suggests that instead of trying fruitlessly to abolish competition as an element of human nature, we should try to guide it into educationally productive channels. "Constructivism." A psychological term used by educational specialists to sanction the practice of "self-paced learning" and "discovery learning." The term implies that only constructed knowledge-knowledge which one finds out for one's self-is truly integrated and understood. It is certainly true that such knowledge is very likely to be remembered and understood, but it is not the case, as constructivists imply, that only such self-discovered knowledge will be reliably understood and remembered. This incorrect claim plays on an ambiguity between the technical and nontechnical use of the term "construct" in the psychological literature. Many readers may not be interested in the technical details, but those who are may wish to know that the misleading ambiguity arose as follows. Learning is closely associated with memory, since unrecalled experience cannot be said to be learned. For a long time it has been known that most memories are not just mechanical recollections but constructs built on a whole body of relevant prior experiences. (The constructed character of memory accounts for the unreliability of eye witnesses.) Another example of the constructed character of knowledge is the understanding of language. The meaning of what we read or hear is not transferred directly from one person to another but is constructed by the listener, sometimes incorrectly. Since memory and linguistic meaning constitute a lot of school learning, these two examples alone make plausible the idea that school learning is constructed. The misleading extension of the word to pedagogical method arises from the ambiguity between the idea that memories and word meanings are constructed and the idea that the only way to learn things properly is to construct or discover them for one's self rather than being told them. But since being told things is also a constructive, nonpassive process, the quasi-scientific claim that constructivism favors discovery learning is completely unfounded. In fact, experience has shown that "discovery learning" (which see) is the least effective pedagogical method in the teacher's repertory. "Constructivism" is a good example of the way technical terms are sometimes used to give progressive ideas a spurious scientific-sounding authority. For example, some educationists distinguish between "endogenous" and "exogenous" constructivism. "Endogenous constructivism" is a mystifying term denoting learning that is self-induced by the student; "exogenous constructivism," by contrast, denotes learning that is induced from the outside, usually by the teacher. But note that behind the ponderous rhetoric lies the tacit admission that both discovery learning and guided learning are constructed. This means that, in the end, the term "constructivism" adds little or no illumination. "Cooperative learning." A term describing the pedagogical method of breaking up a class into teams of five or so students who cooperate to complete a joint task or project. One of its advantages lies in its use of more advanced students to help and teach less advanced ones, thus promoting the education of both groups, so long as the two groups are not too far apart in academic preparation. The method still retains vestiges of its historical origins in progressivist practices, when group cooperation was elevated above competition and individual achievement. Recently, parents have complained that capable children who want to do more and better work are sometimes discouraged on the grounds of "not cooperating" with the group. The wise and effective orchestration of several groups in a classroom is difficult to do well, needing careful monitoring, clear purposes, and definite incentives. A faith that the method itself will providentially take care of results is not warranted. Cooperative learning, used with restraint, can be an excellent method of instruction when used in conjunction with whole-class instruction. It has not been effective when used as the principal or exclusive means of instruction. "Critical-thinking skills." A phrase that implies an ability to analyze ideas and solve problems while taking a sufficiently independent, "critical" stance toward authority to think things out for one's self. It is an admirable educational goal for citizens of a democracy, and one that has been advocated in the United States since Jefferson. The ability to think critically is a goal that is likely to be accepted by all American educational theorists. But it is a goal that can easily be oversimplified and sloganized. In the progressive tradition that currently dominates our schools, "critical thinking" has come to imply a counterpoise to the teaching of "mere facts," in which, according to the dominant caricature, sheep-like students passively absorb facts from textbooks or lecture style classrooms. Critical thinking, by contrast, is associated with active, discovery learning and with the autonomous, independent cast of mind that is desirable for the citizens of a democracy. Conceived in this progressive tradition, critical thinking belongs to the formalistic tool conception of education, which assumes that a critical habit of thought, coupled with an ability to read for the main idea and an ability to look things up, is the chief component of critical-thinking skills. This tool conception, however, is an incorrect model of real-world critical thinking. Independent-mindedness is always predicated on relevant knowledge: one cannot think critically unless one has a lot of relevant knowledge about the issue at hand. Critical thinking is not merely giving one's opinion. To oppose "critical thinking" and "mere facts" is a profound empirical mistake. Common sense and cognitive psychology alike support the Jeffersonian view that critical thinking always depends upon factual knowledge. 2.If the tests are not technically biased, what policy decisions should be taken in light of the different group performances on the tests? "Developmentally appropriate." The phrase expresses the idea that education is a natural unfolding, and that for each individual child there is a natural and best time for learning certain subjects and skills. The term often accompanies a desire to preserve childhood innocence from adult civilization. Early-childhood specialists use the term "developmentally inappropriate" to imply that "premature" exposure and early hard work are harmful and time-wasting. Thus, the term "developmentally appropriate" is generally used to discourage schools from teaching certain subjects too soon, but rarely, if ever, to suggest that subjects are not developmentally appropriate because they are being taught too late. Psychologists have found that there is usually a distinct rise in children's "processing capacity" between age three and age five. But they have also found that there is a great amount of individual variation in children's intellectual development. As generally used, the term "developmentally appropriate" is devoid of scientific meaning and lacks scientific authority. It is not scientifically credible, for instance, that learnings which millions of children throughout the world are easily acquiring in second grade should be labeled "developmentally inappropriate" for American second graders. Yet that is precisely what American early-childhood specialists have stated about the teaching of mathematical place value. The consensus among psychologists is that after age six or so, school-based learnings follow a sequence determined not principally by nature or by chronological age but mainly by prior knowledge, practice, and experience. Many advantaged children receive in their homes the early practice and knowledge they need, whereas many disadvantaged children gain these preparatory learnings, if at all, only in school. The learning processes involved in the unnatural skills of reading, writing, and arithmetic are inherently slow at first, then speed up cumulatively and exponentially. Because of the cumulative character of school learning, educationally delayed children rarely catch up. When an elementary school declines to teach demanding knowledge and skills at an early age, the school is unwittingly withholding education differentially from different social classes. As a result, the doctrine of developmental appropriateness, which holds back all students, has had especially deleterious effects on disadvantaged children and on social justice. "Discovery learning." The phrase refers to the teaching method which sets up projects or problems so that students can discover knowledge for themselves through hands-on experience and problem solving rather than through textbooks and lectures. Progressivists made discovery learning the chief or exclusive form of teaching starting with the "project method" (which see.) The premise is true that knowledge acquired on one's own, with difficulty and by expending lots of time and effort, is more likely to be retained than knowledge presented verbally. It is also true that knowledge gained in a realistic context as part of an effort to solve a problem is likely to be knowledge that is well understood and integrated. Unquestionably, then, discovery learning is an effective method-when it works. But there are two serious drawbacks to preponderant or exclusive reliance on discovery learning. First, students do not always make on their own the discoveries they are supposed to make; in fact, they sometimes make "discoveries" that aren't true. Hence, it is essential to monitor students to probe whether the desired learning goal has been achieved, and if not, to reach the goal by direct means. Second, discovery learning has proved to be very inefficient. Not only do students sometimes fail to gain the knowledge and know-how they are supposed to gain, but they do not gain it very fast. Research into teaching methods has consistently shown that discovery learning is the least effective method of instruction in the teacher's repertory. "Exhibitions." Another term for "performance-based assessments." At the end of a period of study, students are asked to exhibit their achievements by handing in a portfolio, displaying a project, demonstrating a proficiency, or some combination of these. Exhibitions are excellent, though subjective, devices for motivating students at the classroom level. In the classroom, strict fairness and accuracy in the grading of every student effort, while always to be sought, may sometimes be less important values than effective teaching and learning. So exhibitions should not be repudiated simply because the grading of them has proved to be arbitrary and inconsistent. Exhibitions cannot be used, however, for large-scale, high-stakes testing beyond the individual school or classroom without sacrificing economy, accuracy, and fairness. "Factory-model schools." A disparaging term used by progressivists to describe the sort of school system created to accommodate ever greater numbers of students in the early twentieth century. The massive new school system is pictured as a bureaucratic hierarchy topped by a superintendent or factory foreman whose job is to make sure that all the schools in the production line are performing in lockstep. Within classrooms, too, the factory-model school is pictured as imposing uniformity on students. They are described as sitting in rows, passively listening while an authoritative teacher indoctrinates them in what the system wants them to know and how the system wants them to think. 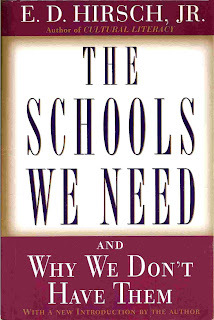 For many progressivists, the most important objection to factory-model schools is their association with "traditional" education, that is, with the lectures, the authoritative teacher-boss, the desks in straight rows, and the student passivity, as well as with rote memorization, "regurgitation" of facts, and lack of joy and independent thought. With such a picture as the only available alternative, it would be hard not to prefer the individualistic, joyful picture of the naturalistic classroom painted by progressivists. Both pictures are myths. The historical reality is more confusing. In the early twentieth century, school systems had to enlarge to accommodate a huge growth in the school- attending population. The progressive movement itself presided over the creation of enlarged school systems in the 1920s and '30s, even as it promoted progressive pedagogical reforms; for instance, the authors of the Cardinal Principles (1918), the blueprint for the new factory-model schools, were by and large adherents to progressive themes such as "individual differences." No modern industrial nation has been able to avoid some elements of the "factory model" in its efforts simply to educate ever larger percentages of the population. What is really at stake in the polemical use of the term is the association of the factory model with "traditional" pedagogy, as though the two were indissolubly wedded. On the contrary, within a factory-like, hierarchical school system, it is possible to have nontraditional, progressive-style classrooms. That is precisely the arrangement we have today in the United States. Progressive ideas dominate the system's hierarchy. What makes our current system ineffective is the educational ineffectiveness of those ideas. The best hope for improving our "factory" system, which in some form all modern nations are stuck with, is to provide more coherent and focused teaching, with a view to achieving more specific and coherent goals. "Facts are inferior to understanding." The opposition expressed in this and similar phrases between facts and understanding is a hallmark of progressivism. It is true that facts in isolation are less valuable than facts whose interrelations have been understood. But those interrelations are also facts (if they happen to be true), and their existence also depends entirely upon a knowledge of the subordinate facts that are being interrelated. Since understanding depends on facts, it is simply contradictory to praise understanding and to disparage facts. "Facts are soon outdated." Phrased in various ways, this is one of the most frequently stated antifact propositions of the American educational community. From being so often repeated, it has achieved axiomatic status. Its ultimate originator may not have been William Heard Kilpatrick, but in the 1920s he was certainly the doctrine's chief promulgator and popularizer. He taught and spellbound some thirty-five thousand potential professors of education during his brilliant teaching career at Teachers College, Columbia University. He made it a central theme of his book Education for a Changing Civilization (1926). The facts- are- always- changing idea gains what modest plausibility it has from the observation that history and technology are indeed constantly changing. But this truism would seem to be a good argument for teaching the central facts (for instance, the elements of the periodic table) which do not change rapidly, if at all, and which are useful for understanding and coping with the changes that do occur. Facts that quickly lose their educative utility should indeed be cast out of the curriculum in favor of those having a longer shelf life. But a careful case has not yet been made for the transitoriness of significant factual knowledge. Facts are central to "higher-order skills," and therefore need to be strongly emphasized even (or especially) when the goal of education is seen to be the development of "understanding" and of "thinking skills." "Hands-on learning." A phrase that implies the superiority of direct, tactile, lifelike learning to indirect, verbal, rote memorization. Multisensory learning is indeed an excellent method for integrating and fixing what a child learns, for instance, the use of tactile methods to help children learn the letters of the alphabet. (In one version of that method, children run their fingers over bumpy cutouts of the letters, and this hands-on experience, combined with visual perception and with hearing and pronouncing the names of the letters, helps connect the letter shapes to the names by multiple sensory means that reinforce each other.) Apprenticeship teaching, too, is an enormously effective, integrated, hands-on mode of learning a trade or profession. Caution must be expressed, however, regarding the polemical use of the term to support a single kind of teaching. Very often the term "hands-on" is an honorific term used to praise the progressivist "project method" of education and to disparage a "whole-class instruction," which is conducted mainly by visual and verbal means. Experience does not bear out the superiority claimed for the project method in its various manifestations, called variously "discovery learning," "holistic learning," and "thematic learning." The research suggests that such methods are uncertain, unfair (not all children learn from them), and inefficient, and therefore should be used sparingly. Caution is especially required when the phrase "hands-on" is used to imply disdainfully that visual and verbal learning is artificial and unengaging. Antiverbal prejudices spell disaster for disadvantaged students, who have not been exposed to a breadth of verbal learning outside the school. In contemporary life, the verbal has a strong claim to being just as lifelike as the tactile. "Higher-order skills." A phrase for the superior thinking skills that many current educational reforms aim to achieve. The goal is to produce students who can think and read critically, who can find information, who have mastered metacognitive strategies, and who know how to solve problems. Such students, it is asserted, will be far better prepared to face the challenges of the twenty-first century than those who merely possess a lot of traditional, soon-to-be-outdated, rote-learned information. Behind this contrast between higher order thinking skills and lower-order information lies the formalistic tool conception of education, which has been repudiated by mainstream cognitive psychology. If in fact the learning of higher-order skills did suffice to produce critical thinkers prepared for the challenges of the twenty-first century, we and our students would be very fortunate indeed and could forgo a great deal of the hard work associated with gaining factual knowledge and well-practiced operational skills in reading, writing, and mathematics. Since, unfortunately, this tool conception is incorrect, the outlook for the effectiveness of such "reforms" is dim. Higher-order skills are invariably and necessarily conjoined with a great deal of relevant, domain-specific information. Hence, there is no way to gain the skills without gaining the associated information. It is mere prejudice to assert that the strategies associated with using domain-specific information are of a "higher order" than the knowledge itself. This fact has led some cognitive scientists to use the more neutral term "associated strategies" rather than "higher-order skills." "Holistic learning." A term for classroom learning organized around integrated, lifelike problems and projects rather than around standard subject matter disciplines. The holistic teaching of math, for example, integrates it with lifelike situations and with other subject matters. Among the hoped-for advantages of holistic teaching are 1) increased motivation for children on the grounds that they can see the relevance of learnings which are part of larger or more realistic contexts, and 2) a more natural mode of teaching such as might be gained by life experience itself. The holistic organization of teaching is often combined with the method of "discovery learning" (which see). "Holistic learning" has essentially the same meaning as "thematic learning" and "the project method." It is not limited to progressivist-style projects, however. Holistic, contextualized teaching has always been a part of standard subject matter instruction, as when American history is integrated with American art in order to provide a more vivid sense of the past, The method is less successful when used to teach a specialized subject or skill like mathematics, which requires a lot of practice. The exclusive use of holistic or naturalistic methods has been shown to be less effective than using it sparingly within more focused, goal-directed pedagogies. As with most progressivist methods, it is not the technique itself but its injudicious overuse, in the confidence that naturalistic methods automatically lead to good results, which has made much holistic teaching ineffective. "Individual differences." A phrase reflecting the admirable desire to combine mass schooling with respect for diversity and individuality. An important early use of the phrase was in a manifesto of education, the Cardinal Principles of 1918. The individual differences referred to there were mainly differences in academic preparation and ability, and the accommodation of those differences took the form of ability tracking. Currently, a more egalitarian use of the term implies that children differ in temperament, personality, and the kind of talents they have, and that they have different learning styles and different needs. Children are allowed to proceed "at their own pace," sometimes in multiaged classrooms, and are encouraged to develop their special talents. However, because mass education cannot be organized into individual tutorials, the practical result of the current egalitarian terminology has been de facto ability tracking. Too often, the term "individual differences" can become a rationalization for expecting and demanding less from children for whom we need to provide more support-inherently able students from disadvantaged homes. "Individualized instruction." An ideal in education that recognizes individual differences in talent, interest, and preparation. It is universally acknowledged that the individual tutorial is the most effective form of teaching known. Tutorial instruction is not possible, however, in public schools, where the student teacher ratio is typically 20 to 1. For that reason, an attempt in the public schools to provide individual instruction to some students often results in individual neglect for others, in the form of isolated, silent seatwork. In typical schools, the best results for most individual students are gained not by one-on-one tutorials but by a predominant use of whole-class instruction, in which all students participate. This interactive, whole-class pedagogy is then supplemented by small-group, cooperative learning, by moderate individual seatwork, and by individual coaching. "Intellectual capital." A phrase denoting the knowledge and skills a person possesses at a given moment. Studies have shown that the level of a person's intellectual capital is highly correlated with a person's ability to earn still more money and to gain still more knowledge and skill. As with money capital, the more knowledge and skill one already has, the more one can readily acquire. The idea of intellectual capital opposes itself to the tool conception of education, under which a mere store of knowledge is deemed less important than the gaining of learning skills. In the present book, the work of sociologists and cognitive psychologists has been cited to show that the tool conception is much oversimplified, that skills always require domain-specific knowledge. Hence, intellectual capital, repudiated under the tool conception as inert, soon-to-be-outdated baggage, is in reality the main tool of future learning and earning. "Learning by doing." A phrase once used to characterize the progressivist movement but little used today, possibly because the formulation has been the object of much criticism and even ridicule. It is instructive, however, to include the phrase here because it continues to illuminate the progressivist tradition. Terms currently preferred to "learning by doing" are "discovery learning," and "hands-on learning," but it is important to remember that these latter-day phrases are adaptations of the earlier formulation. The idea behind all of the terms is that the most desirable pedagogy is natural in the sense that it resembles the real-life activities for which the particular learning is preparing the student. It is claimed that the best form of learning is that which best allows the student to learn in the natural, apprentice-like way in which humans have always learned. It implicitly opposes itself to education that is primarily verbal, as well as to schooling that is artificially organized around drill and practice. By performing "holistic" activities, the student, it is claimed, will reliably discover the needed learnings. This is an attractive doctrine, but it is also a highly theoretical one that has proved to be false. The value of such a method depends on its actual effectiveness. If by "effective" one means that aft students learn reliably and efficiently by this method, then the theory has been entirely discredited in comparative studies. Both the recent history of American education and controlled observations have shown that learning by doing and its adaptations are among the least effective pedagogies available to the teacher. "Learning to learn." A phrase used to denote the principal aim of schooling under the tool conception of education. The idea is that the possession of a lot of knowledge which will soon be outmoded is educationally useless, whereas if one has the ability to learn, that will be a permanent acquisition. The theory is expressed in the proverb "It is better to teach a child to fish than to give a child a fish." Teaching a child how to learn is, using this analogy, better than teaching a child a lot of facts. Everyone agrees that education should provide students with an ability to learn new knowledge and even new professions. But the tool conception, which makes the fish inferior to the hook, line, and sinker, is based upon a gravely inadequate metaphor of the skill of learning. Indeed, even learning how to fish requires a great deal of domain-specific knowledge not just fishing equipment and a few techniques. As this book explains in some detail, the opposition between learning skills and factual knowledge is an almost totally misleading opposition that has had tragic economic and social consequences. "Less is more." This phrase is meant to imply that depth is preferable to breadth in schooling. In some circumstances, the idea is certainly true, but the catchiness of the paradoxical formulation should not be permitted to mask the doubtfulness of the idea as a general proposition that can reliably guide teaching or curriculum making at different levels of schooling. The motto is generally valid in one limited respect: selectivity of knowledge is important at all levels. But the balance between breadth and depth in schooling is a perennially thorny issue that is not to be disposed of by a simple slogan, especially one that has all too often encouraged both teachers and students to slack off. If less is more, then skipping a subject altogether might begin to seem a virtue-an attitude not altogether foreign either to the progressive tradition or to many teachers who have been influenced by it. In general, contrary to the motto, breadth is preferable to depth in early schooling, where the child should be provided with a conspectus of the various domains of knowledge and experience so that new learnings can be readily integrated into his or her web of understanding and belief. In the later grades of high school and at the university, when a student has already secured a broad enough background to enable future learning in many fields, he or she should be encouraged to focus more narrowly and probe more deeply. In most cases, the balance between depth and breadth is a subject of a complex judgment that takes into account subject matter, the purpose, and the stage of schooling. "Lifelong learning." The phrase reflects a goal shared by almost all educators since antiquity. Today, when new technologies must be mastered and even new professions learned, the task of making everyone competent to learn throughout life is a primary duty of the schools. There exists, however, a disagreement about the nature of the schooling that best promotes a lifelong ability to learn. Under the tool conception of learning, students must be given not only reading, writing, and computational ability but also further abstract competencies such as "accessing skills," "critical-thinking skills," and "higher-order skills," in the belief that these abstract competencies can then be directed to an indefinite number of future tasks. Of course, everyone should be provided with the tools to learn and to think critically. But the dominant progressive tradition has made a fundamental empirical mistake in believing that these general competencies do not depend upon the accumulation of knowledge and vocabulary, and in believing that transferable lifelong competencies will arise naturally from "holistic," integrated activities. Lifelong competencies, including reading, writing, and critical thinking, depend upon the domain specific factual and verbal knowledge spurned by many present-day "reformers." "Mere facts." The phrase "rote memorization of mere facts" may be the most vigorous denunciation of "traditional" education to be found in the progressive armory. The phrase describes an activity that compounds deadly pedagogy (i.e., rote memorization) with deadly content (i.e., mere facts). In Romantic progressivism, facts are dead, but hands-on, lived experience is alive; facts are inert and disconnected, but understanding is vital and integrated. The nineteenth-century romantic William Wordsworth once said that we "dwindle as we pore" over facts "in disconnection, dead and spiritless," and he urged us to see facts imaginatively. For his American successors, mere facts are always disconnected, dead, and spiritless. Their "mereness" implies their inherent disconnection and artificiality. As soon as real "understanding" occurs, however, mere facts are transcended. There is some validity in this conception, as there usually is in most views that are long and widely held. Understanding does mean connecting facts; isolated facts are meaningless. Where the progressive-Romantic indictment of facts falls short is in the exaggerated idea that facts which are not directly and immediately connected with one's life are inherently fragmented and dead. That blanket accusation amounts to an antiverbal, anti-intellectual distortion. Facts are absolutely necessary to understanding. Whether they are dead and fragmented depends upon teachers and students, not upon the facts themselves, which are not only required for understanding but are sometimes immensely vital and interesting in their own right. "Metacognitive skills." A term that, like "constructivism," has a legitimate technical but an illegitimate nontechnical meaning. The illegitimate, broader application of the term identifies it with "accessing skills," "critical-thinking skills," "problem-solving skills," and other expressions of the antiknowledge tool conception of education. The narrower, technical meaning has useful application. Technically, in the scientific literature, "metacognition" means a self-conscious awareness of one's own procedures in performing skilled activities. ("Meta" means "after" or "beyond" in Greek.) For instance, in solving math problems, a skilled mathematician might think, "First I'll estimate the range within which the right answer is going to fall so that I can be more confident I am going at this right and didn't make a clerical error." Or a good reader could silently think, "I wonder what this text is mainly trying to convey. Knowing that will help me fit in the individual parts I am reading." Such self-conscious monitoring of one's own activities is characteristic of expert performance. Children who have learned how to set and meet such study goals for themselves (e.g., how to scan a text for the main meaning, how to decide on what is more or less important in a subject with respect to their own study aims) are students who are better able to work independently. Such study skills should clearly be encouraged where this can be done effectively without displacing or distracting from solid subject-matter knowledge. The teaching of such self-conscious monitoring can speed up the learning of reading and problem-solving skills. But since expert skills are also dependent on domain specific knowledge, the teaching of metacognition in this narrow sense is recognized as a useful but not sufficient help in learning a skill. "Multiaged classrooms." A phrase referring to the grouping of children by proficiency rather than by age, with the result that children of different ages find themselves grouped together. The recent popularity of this idea may owe more to political and ideological pressures than to the demonstrated effectiveness of the practice. One such pressure is the great diversity of academic preparation of children of the same age in American schools. This preparation gap would be reduced by a more coherent and specific curriculum and by more accountability for definite grade-by-grade standards. Another cause is the egalitarian reaction against ability tracking, which means that tracking, if it is to exist, has to march under the banner of "learning at one's own pace." The most troublesome feature of the multiaged classroom is the disproportionate number of older students in each learning group who come from disadvantaged homes and who belong disproportionately to ethnic minorities. The result of officially sanctioning their slow progress is a perpetuation of social unfairness, as detailed in the entry under "At their own pace." "Multiple intelligences." A phrase popularized by the psychologist and author Howard Gardner. It is meant to replace the concept of IQ (a single general intelligence) with a theory of seven domains of ability under which almost every child can be good at something. The seven domains are linguistic, logical, mathematical, spatial, musical, bodily-kinesthetic, interpersonal, intrapersonal. Neither Gardner's specific taxonomy nor his general interpretation is widely accepted by the psychological community. Nonetheless, specialists and laypersons alike concede Gardner's general point that people are better (more "intelligent") at some activities than at others. Despite the fact that schools are not competent to classify and rank children on these highly speculative psychological measures, the concept has become highly popular, probably became it fits in with the already popular notions of "individual differences," "individual learning styles," "self-paced learning," and so on, not to mention its appeal to our benign hope for all children that they will be good at doing something and happy doing it. The distinguished psychologist George A. Miller has said that Gardner's specific classifications are "almost certainly wrong." Miller gets to the educational heart of the matter when he observes that even if the classifications were right, no descriptive theory of multiple intelligences could tell us what policies and methods schools ought to pursue. Should they accentuate students' strengths, overcome their weaknesses, or both? The common-school tradition of Horace Mann (with which Gardner would probably agree) implies that we should both encourage students' strengths and overcome their weaknesses, especially in those competencies such as literacy, numeracy, and general knowledge which enable their effective participation in the economic and political life of the nation. Once those common goals are agreed upon, psychological classifications would seem to have little function beyond the encouragement of respect and egalitarianism-admirable virtues that do not require the support of psychological speculation. "Multiple learning styles." See "Individual differences," "Individual learning styles," and "Multiple intelligences." "One size fits all.'' A phrase that disparages the idea of common learning goals for all children regardless of their interests and abilities. The phrase implicitly advocates the individualizing of education as much as possible-a highly defensible view, since individualized tutorial instruction is, by general agreement, the most effective form of schooling. Simply on grounds of educational utility, then, apart from other grounds such as the value of diversity, a sensitivity to each child's individuality is greatly to be desired. But like many such battle slogans in the war of progressivists against traditionalists, subtleties and complexities are obliterated in the heat of battle. The slogan makes no concession to the practical need for commonality in the elementary grades, which is required simply to ensure that each child in a classroom is ready to take the next step in learning. In high school, on the other hand, once the fundamentals of math, reading, writing, art, and science have been learned, it makes a great deal of sense for the good of the child, as well as of society, to stress a child's individual interests and abilities. "Outcomes-based education." A term of uncertain meaning which during the 1990s became a symbolic cause of verbal war between political liberals and conservatives. It is best understood historically. In the late 1980s and early '90s, in the midst of public discontent with students' test scores in reading and math, some professional educators proposed that schools pay relatively less attention to methods of schooling, such as discovery learning, and more attention to results. They labeled this idea "outcomes-based education." Their goal was to correlate teaching methods more closely with results. The label stuck, but the idea behind it subtly changed in the early 1990s, when committees of teachers and administrators gathered to define what outcomes were to be achieved. Because of the general antipathy in the educational community to an emphasis on facts, subject matter, and content, the outcomes drafted by these committees tended not to emphasize knowledge so much as various tool metaphors for education and virtue in the form of democratic attitudes and emotions. These included respect for all people, including people of diverse races, religions, and sexual orientations. It was this last idea, and similar socially liberal notions, which raised red flags with conservatives. Thus the battle began, with the term "outcomes-based education" being viewed as a left-leaning conspiracy. It could also be viewed as the transformation of a reasonable idea into impractical vagueness through progressivist antipathy to subject-matter knowledge. "Passive listening." A progressivist phrase caricaturing "traditional" education, which makes children sit silently in rows in "factory-model schools," passively listening to what the teacher has to say, then merely memorizing facts through "rote learning," and finally "regurgitating" the facts verbatim. If this picture really did characterize whole-class instruction, progressivists would be right to reject it. But observations of "whole-class instruction" (which see) in the United States and elsewhere provide a very different, far-from-passive picture of what children are actually doing and learning in whole-class instruction. The caricature is another example of the way a valid point gets carried too-far through simplistic slogans, causing teachers to become polarized and to reject sensible practices. The implication is that whole-class instruction makes the teacher boss instead of friendly coach, leads children to become docile and unable to think for themselves. Progressivists claim that this docility is just what traditionalists want to achieve, whereas progressive methods will produce independent-minded, active students who think for themselves, To the extent that more "active" methods like "discovery learning" provide children with less factual knowledge on which to base independent judgments, the claim to produce independent-mindedness seems doubtful. "Problem-solving skills," A phrase often used in conjunction with "higher order skills" and "critical-thinking skills." In a narrow sense, it refers to the ability to solve problems in mathematics or other specialized fields. More broadly, it refers to a general resourcefulness and skill that will enable the student to solve various future problems. The nature of this general problem solving skill has not been scientifically defined, and it is doubtful that it exists. Work on the problem-solving abilities of specialists like doctors, chess players, and physicists has shown consistently that the ability to solve problems is critically dependent on deep, well-practiced knowledge within the special domain, and that these problem-solving abilities do not readily transfer from one domain to another. In short, there seems to exist no abstract, generalized, teachable ability to solve problems in a diversity of domains. For schools to spend time teaching a general skill that does not exist is clearly a waste of resources, which illustrates the inherent shortcomings of the tool conception of education. "Project method." A phrase used to describe the naturalistic form of teaching devised by W. H. Kilpatrick at the beginning of the progressive education movement. His article called "The Project Method" (1918) was the most widely distributed article on American education that had appeared up to that time. Under the project method, subject-matter classrooms were to be abandoned in favor of "holistic," lifelike projects that would enable students to gain the life skills they needed by working in cooperation with their fellow students. The method presented itself in opposition to traditional subject matter education. It abolished the lecture- and -recitation format, tests, grades, and drills. The method was based on a Romantic faith in the superiority of a natural to an artificial approach in learning. It claimed, incorrectly, to be based also on the latest findings in psychology. Subsequently, observers found the project method to be the least effective mode of pedagogy in use in American schools. The method came under increasing criticism, and the term "project method" fell out of favor. But terminology shifted, and the practice itself remained in different forms and under different names, such as "discovery learning," "hands-on learning," "holistic learning ... .. learning by doing," and "thematic learning." "Promise of technology." The phrase suggests that computers will revolutionize and transform schooling. Caution is called for. Some explanation is needed for the fact that student scores have not significantly risen in schools that have been well supplied with computers. Many reasons for this disappointment have been offered: teachers have not learned how to use these instruments; good software is slow in coming; the school has not become fully computerized. Undoubtedly, computers will be able to enhance pedagogical principles that are already known to work. One fears, however, that the enthusiasm for computers is based upon a confidence in technical solutions that has not been well explained in theory or well documented in experience. Most of all, one fears that enthusiasm for computers will simply reinforce and prolong the now discredited tool conception of education, which claims falsely that education consists ideally in learning the tools that will enable one to learn things in the future-and what better tool for this purpose could there be than the computer? But there is no evidence that its advent has reduced the need for students to have in their minds well-practiced habits and readily available knowledge. Quite the contrary, the more one looks things up via computer, the more often one needs to understand what one is looking up. There is no evidence that a well-stocked and well-equipped mind can be displaced by "accessing skills." "Research has shown." A phrase used to preface and shore up educational claims. Often it is used selectively, even when the preponderant or most reliable research shows no such thing, as in the statement "Research has shown that children learn best with hands-on methods." Educational research varies enormously in quality and reliability. Some research is insecure because its sample sizes tend to be small and a large number of significant variables (social, historical, cultural, and personal) cannot be controlled. If an article describes a "successful" strategy, such as building a pioneer village out of Popsicle sticks instead of reading about pioneers, the success may not be fully documented, and the idea that the method will work for all students and classrooms is simply assumed. There are strong ethical limits on the degree to which research variables can or should be controlled when the subjects of research are children. Many findings of educational research are highly contradictory. Greatest confidence can be placed in refereed journals in mainstream disciplines. (A refereed journal is one whose articles have been checked by respected scientists, or referees, in a particular specialty.) Next in reliability is research that appears in the most prestigious refereed educational journals. Very little confidence can be placed in research published in less prestigious journals and in nonrefereed publications. The most reliable type of research in education (as in medicine) tends to be "epidemiological research," that is, studies of definitely observable effects exhibited by large populations of subjects over considerable periods of time. The sample size and the duration of such large-scale studies help to cancel out the misleading influences of uncontrolled variables. An additional degree of confidence can be placed in educational research if it is consistent with well-accepted findings in neighboring fields like psychology and sociology. Educational research that conflicts with such mainstream findings is to be greeted with special skepticism. The moral: Print brings no reliable authority to an educational claim. When in doubt, ask for specific references and check them. Many claims evaporate under such scrutiny. "Rote learning." The phrase "rote learning" is often followed by the phrase "of mere facts." The practice of rote learning dates back to the now-little-used method of asking a whole class to recite in unison set answers to set questions-whether or not the students know what their recitations mean. That practice has all but disappeared. When present-day educators have been asked what they now mean by the phrase "rote learning," they respond variously that it means "spouting words" without understanding their meaning, or memorizing items without understanding them, or learning a lot of isolated facts. They object that rote memorization breeds a passive and uncritical attitude in students, who, as we all hope, will grow up to be independent-minded citizens. All of these objections to rote learning have validity. It is better to encourage the integrated understanding of knowledge over the merely verbal repetition of separate facts. It is better for students to think for themselves than merely to repeat what they have been told. For all of these reasons, rote learning is inferior to learning that is internalized and can be expressed in the student's own words. These valid objections to purely verbal, fragmented, and passive education have, however, been used as a blunt instrument to attack all emphasis on factual knowledge and vocabulary. Some purely rote learning is, for example, indispensable to learning the words of one's own language, since there is rarely a nonarbitrary reason why particular names are attached to particular things in the world. Nor is there any very meaningful reason why English spelling should use "i" before "e" except after "c" or when sounded as "a" as in "neighbor" or "weigh." Or why "thirty days bath September." Yet it is highly useful to rote-learn those and many other helpful facts. The way things have been learned, whether by rote or other means, very often drops entirely out of memory. Psychologists distinguish "episodic" memory, which may be short-lived, and "semantic" memory, which is very durable. The episode of learning is insecurely stored in volatile episodic memory; hence, it often doesn't matter exactly how things are learned, so long as they are learned. In the progressive tradition, the attack on rote learning (timely in 1918) has been used to attack factual knowledge and memorization, to the great disadvantage of our children's academic competencies. "Self-esteem." A term denoting a widely accepted psychological aim of education. There is consensus in the psychological literature that a positive sense of one's self is of great value to achievement, happiness, and civility to others, whereas a negative sense of one's self leads to low achievement, discontent, and social bitterness. The critical question for school policy and teaching is how far on average self-esteem can be induced by positive reinforcement on the teacher's part. There is agreement that some degree of positive reinforcement is necessary, and that teachers should be kindly and encouraging to all students. But there is growing agreement among psychologists that verbal and affective reinforcement is not sufficient, and can in fact be counterproductive if the child is not persuaded. There is strong evidence in the mainstream literature that praise in the absence of achievement does not raise achievement. The best enhancements of self-esteem, according to both psychological and process-outcome literature, arise from accurate and matter-of-fact appraisals of a student's work, as well as realistic encouragement toward effort and actual achievement. "Student-centered education." Another phrase for "child-centered education" (which see), but with the word "student" substituted for "child" to bring the principle into the middle school and high school years. It expresses the idea that it is more humane to focus on the well-being of the child than on "mere" academic learning. But schools are not organized, and their staffs are not trained, to reliably secure the spiritual and psychological well-being of students, though good teachers often inspire by example. Schools are organized and instituted primarily to teach subject matters and skills, and it is their first duty to do so as effectively as possible. forces them. As with various forms of the "project method," however, thematic learning has proved to be more successful when used with prudence as an occasional device than when used consistently as the primary mode of instruction. One reason for entering this caution is that some subjects require different amounts of exposure than others in order to be learned. History and literature, for example, generally require fewer reinforcements to achieve a learning goal than do certain aspects of math and science, whose procedures must be often repeated and practiced. The thematic approach may or may not provide these needed reinforcements. As with most pedagogical methods, the key is common sense. If students have been well monitored and are known to have mastered the basic subject matters that are to be dealt with in the thematic project, then the method is an attractive way of encouraging student enthusiasm and further learning. "Teaching for understanding." A phrase that contrasts itself with teaching for "mere facts." It is associated with the motto "Less is more," which implies that depth is preferable to breadth in education, on the claim that depth leads to understanding, whereas breadth leads to superficiality and fragmentation. Few would dissent from the aim of teaching for understanding. Clearly the term needs different interpretations in the different grades. Take the alphabet. A kindergartner should understand the principle that the letters of the alphabet represent sounds. At a later stage, students should understand some peculiarities of English spelling and the differences between vowels and consonants. Still later, students might come to understand the historical uniqueness of the alphabetic system of writing, as contrasted with the various other modes of representing language in visual form such as hieroglyphics and ideograms. From this simple example, it is obvious that the phrase "understanding the alphabet" has very different content in different circumstances, and that the "deeper" understanding becomes, the more "mere facts" are required. A middle-school child does not need to understand what cuneiform is, or the difference between alphabetic and syllabic modes of phonological writing. As understanding of the alphabet advances, the university student may need to learn this additional information. Few would disagree with a general preference for integration over fragmentation of information, but it is hard to get much useful guidance or meaning from the phrase "teaching for understanding." "Teach the child, not the subject." A phrase connoting the principle behind "child-centered schooling" (which see). The benign and reasonable interpretation of this famous battle cry of progressivism is that one should attend to the moral, emotional, and spiritual well-being of the child at the same time that one is providing an excellent grounding in reading, writing, and arithmetic. Only a hard-hearted person would dissent from this goal. Historically, however, the progressive tradition has continued to attack the disciplined teaching of reading, writing, and arithmetic in favor of "holistic" methods, which supposedly engage and educate the whole child. Progressivists have also continued to disparage merely academic learning. Not surprisingly, disparagement of "the subject" has resulted in a diminishment of student competency in subject matters. "Teach the whole child." The third of the original three child-centered phrases of progressivism: "child-centered schooling," "teach the child, not the subject," and "teach the whole child." All three phrases enjoin the schools to take a more humane, less subject-matter-oriented position toward schooling. It is true that the responsibility of the school extends beyond purely academic skills. Not many would dissent from the hope that in addition to providing training in academic skills, schools will nurture the physical and emotional well-being of children, as well as enhance their civic and personal virtue. Progressivists did not, however, explicitly teach these different spheres of education, but claimed that the development of the whole child would automatically arise from holistic instruction, in which children had to work cooperatively in simulations of real life. In this Romantic faith they were wrong. It was understandable that in the teens and twenties of this century, Americans might still entertain such naturalistic, providential hopes. If we wish to inculcate civic and personal virtue, that too needs to be the object of guided instruction, however indirect and subtle, and monitored for uptake. The theory of automatic, holistic learning has proved to be incorrect. "Textbook learning." A phrase disparaging traditional forms of education, symbolized by textbooks, in favor of more "holistic" and lifelike modes of instruction in which knowledge is gained from hands-on experience rather than from verbal statements in textbooks. Often, the objection to teaching by means of textbooks has all too much validity, because many currently available textbooks are unselective and unemphatic, having been designed to pass through textbook-adoption committees in populous states and, therefore, to please everyone. As a consequence, many textbooks tend to be unfocused, ill-written, bland, difficult to learn from, and lacking in discrimination between the more and the less important aspects of a subject matter. But the alternative to textbook instruction, in the form of hands-on, project-style teaching, has been shown to be highly ineffective. One must be careful, therefore, to distinguish between a justified attack on bad textbooks and an attack on the carefully focused teaching of subject matter through good textbooks. The most effective subject-matter learning is often achieved through the use of well-written, well-thought-out textbooks. In the sciences and in professions such as medicine and engineering, well-crafted textbooks have always been a necessity. "Thematic learning." A phrase used to describe the "holistic" teaching of different subject matters across a common theme. For instance, the theme of "The Seasons" might combine a study of history, art, science, and mathematics in a particular classroom, or grade, or throughout an entire school. There is much to be said for integrated learning that contextualizes subjects and reinforces them. As with various forms of the "project method," however, thematic learning has proved to be more successful when used with prudence as an occasional device than when used consistently as the primary mode of instruction. One reason for entering this caution is that some subjects require different amounts of exposure than others in order to be learned. History and literature, for example, generally require fewer reinforcements to achieve a learning goal than do certain aspects of math and science, whose procedures must be often repeated and practiced. The thematic approach may or may not provide these needed reinforcements. As with most pedagogical methods, the key is common sense. If students have been well monitored and are known to have mastered the basic subject matters that are to be dealt with in the thematic project, then the method is an attractive way of encouraging student enthusiasm and further learning. "Transmission theory of schooling." A derogatory phrase used by progressivists to imply that traditional schooling merely transmits an established social order by perpetuating its culture, knowledge, and values. It is contrasted with the more "modern" tool conception of schooling, which aims to produce students capable of thinking independently and of criticizing and improving the established social order. In progressivist writings of the 1920s and '30s, the transmission theory of education was identified with a decadent and static Europe, while the open-ended tool conception was identified with a vibrant, forward-moving United States. John Dewey, despite having been claimed by progressivists as their intellectual leader, stated explicitly in Democracy and Education that the transmission theory of education is both sound in itself and an absolutely necessary principle of civilization: "Society not only continues to exist by transmission, by communication, but it may fairly be said to exist in transmission." Dewey was certainly correct in taking this view, which coincides with common sense and with the view of the general public. "Whole-class instruction." A neutral description that has negative connotations in the progressive tradition, since it is understood to imply "lockstep," "factory-model" education. It is caricatured by an authoritarian teacher droning on at the head of the class, or by passive, bored students, barely conscious and slumping in their seats, or by intimidated, fearful students, sitting upright and willing only to parrot back the teacher's words. These are not accurate descriptions of what effective whole-class instruction is. It is predominantly interactive, with much interchange between students and teacher; it makes frequent use of student performances and student comments on the performances; it involves consistent informal monitoring of the students' understanding; it engages all students by dramatizing learning in various ways. An overwhelming concurrence of reports from process-outcome studies shows that a predominant use of whole-class instruction constitutes the fairest and most effective organization of schooling. The attempt to sidestep whole-class instruction, and to provide individual tutorial attention in classrooms of twenty to thirty students, results in individual neglect. It has also been shown that an interactive mode of dealing with the whole class is the liveliest and most effective approach to teaching, and that it is useful to vary the mix with some amount of individual coaching, cooperative learning, and seatwork. All these other approaches should be used within a well-organized whole-class context in order to achieve the best and fairest results. "Whole-language instruction." A phrase denoting an approach to the teaching of reading that emphasizes the joy of good literature and avoids drill-like instruction in letter sounds. In theory, the method is supposed to motivate children by emphasizing an interest and pleasure in books, and by encouraging students to learn reading holistically, just as they learned their mother tongue-as a "psycholinguistic guessing game." Some children do learn to read under this method, but many do not. "Whole language," like "outcomes based education," has grown and spread far beyond its initial confined meaning to become a philosophy of life and teaching, muddled by pseudopolitical associations. The term has become so vague, and so colored with nonpedagogical overtones that it could profitably be dropped entirely from use. After large-scale experience with its unsatisfactory results, especially in California, some former adherents of whole language now advocate a "mixed" approach in which some letter-sound correspondences are taught explicitly. No well-regarded scholar in the field of reading now advocates an approach that neglects phonics and phonemic awareness. Many experts believe that with proper instruction nearly every child can read at grade level by the end of first or second grade. Ce chapitre est le n° 25 sur 40 de Marcel Berry, Une semaine avec ... (CM), 1938. Ce chapitre est le n° 24 sur 40 de Marcel Berry, Une semaine avec ... (CM), 1938. Ce chapitre est le n° 22 sur 40 de Marcel Berry, Une semaine avec ... (CM), 1938. Ce chapitre est le n° 23 sur 40 de Marcel Berry, Une semaine avec ... (CM), 1938. 59. Veux-tu me vendre ton sorcier ? Ce chapitre est le n° 20 sur 40 de Marcel Berry, Une semaine avec ... (CM), 1938. Ce chapitre est le n° 18 sur 40 de Marcel Berry, Une semaine avec ... (CM), 1938. 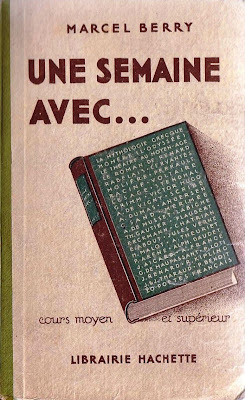 Ce chapitre est le n° 17 sur 40 de Marcel Berry, Une semaine avec ... (CM), 1938.